It was confirmed earlier this week that a prototype Samsung 5G phone would be shown off at Qualcomm’s Tech Summit in Hawaii. Verizon and AT&T have both announced this week that they will offer a 5G smartphone from Samsung in 2019. The handset will most likely be the 5G variant of the Galaxy S10. Samsung showed off the prototype 5G phone yesterday at the summit. The design was obscured in a dark case which isn’t surprising but the odd corner notch certainly is. We have not seen something like this before from Samsung. Engadget reports from Hawaii that Samsung was very protective of this prototype. 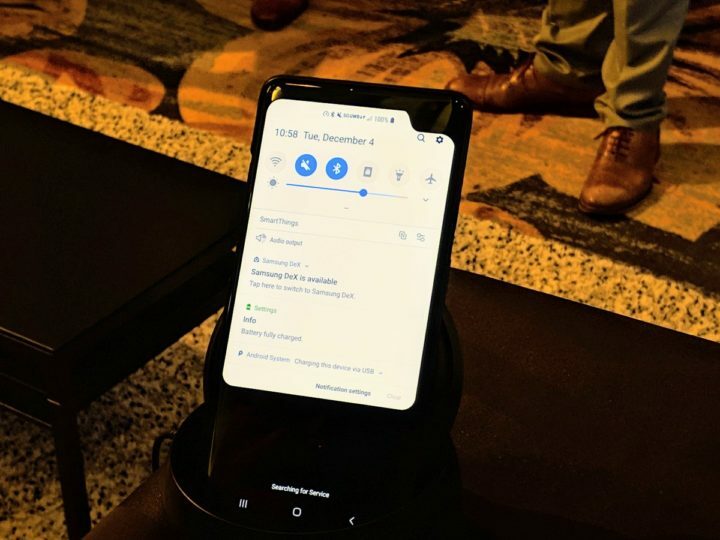 While the handset streamed 4K video over Verizon’s 5G network for display on a big TV screen, Samsung didn’t allow members of the press to even touch the device. It wouldn’t even let anyone turn on the phone’s display until someone managed to convince a representative to do so. That’s when it became evident that this prototype Samsung 5G phone has a rather odd notch in the top right corner. The front camera is also positioned in this corner. It’s not the interface trickery of the One UI beta that lets you simulate various notch styles on the display. It appears to be an honest to God notch, make what you will of it. Samsung has already revealed notched displays for future handsets. The question remains, though, does this prototype reveal any hints about the Galaxy S10? Samsung’s next flagship isn’t expected to feature a notch. It may come with the Infinity-O display instead which punches a hole in the actual display for the front camera. The space that this odd notch is taking up is kind of where some recently leaked renders have placed the Galaxy S10+’s in-hole dual front camera. Don’t read too much into this prototype as far as the Galaxy S10 is concerned. Samsung’s purpose at the summit was to showcase its readiness for 5G. It understandably limited access to the device in order to prevent hype surrounding the Galaxy S10 to overshadow the real purpose. But in this black area is camera or it is only black area without cameras ? Appears to be without camera in this prototype. This is not good idea at all – really weird looking notch. My god! This is worse than the awful Pixel 3XL, that prototype design is a nightmare. OMG!!! Can’t believe what my eyes are seeing. This is beyond outrageous. So much for the notch bashing and mocking and we are about to get this? It’s obviously a multipurpose prototype phone that they experiment with a lot of stuff apart from 5G tests. I bet that somebody just forgot to disable from the developer options the notch emulation setting as they were experimenting with it before producing any prototype with an Infinity-o display so they can fine tune the new UI as fast as possible.